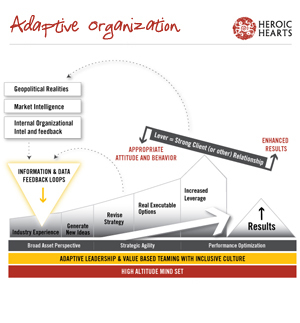 » Why Hire Heroic Hearts? Two characteristics are critical for teams operating in the highest altitude zones, heightened awareness and the ability to respond collectively to sudden changes in the environment. These characteristics are not natural, they require deliberate cultivation both in the creation of world class climbing teams and in building adaptive organizations. 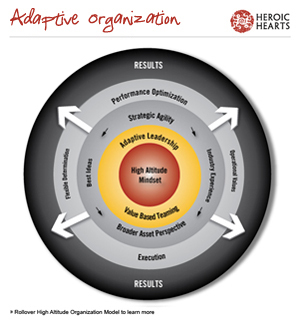 The Adaptive organizational model lays out the principal elements, the cause/effect relationships and the procedures that lie behind a successful adaptive organization.